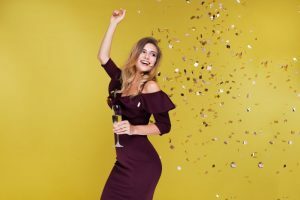 A Dentist Offers 4 New Year Resolutions to Protect Your Mouth! When people make resolutions for the new year, it’s typical that they don’t quite meet their goal. One of the main reasons they don’t follow through with resolutions is because they take on too much at once. Completely transforming a diet or daily routine doesn’t happen in a day, it takes time. If you’re looking for an effective way to improve your health without that much effort, oral health is a great place to start! To help you get started, here are 4 resolutions from a dentist. An overwhelming amount of your oral hygiene is performed at home, not in a dental office. While dental visits are important, it is crucial to maintain a consistent oral care routine to remove plaque and cavity-causing bacteria throughout the day. Brush for at least two minutes at a time twice a day and use a fluoridated toothpaste to do so. Floss at least once a day, ideally before bed, to remove plaque from the sides of teeth and near the gum pockets. This small commitment can make a huge difference in your long-term oral health. For additional protection, consider using a fluoridated mouthwash to protect and strengthen enamel. Make sure to do it after brushing to prevent accidentally removing the protective layer the mouthwash provides. It’s a common resolution to eat better in the new year, but doing so won’t only improve your overall health. Eating a more balanced diet free of artificial sugar and other harmful additives can do your teeth and gums a big favor. When adjusting your diet, take note of the amount of sugar and starch you consume, as these two ingredients are the main contributors to cavity production. Increase the amount of vegetables, fruits, dairy products and whole grains in your daily meals so you can reap valuable nutrients and minerals that promote healthy teeth and gums. Avoid snacking on foods throughout the day. Regarding oral health, the amount of time you expose your mouth to harmful foods is more relevant than the amount you consume. Quitting tobacco is hardly an easy feat. That’s why planning ahead for your quit date and speaking with your general doctor can really help. To quit, make sure to remove all tobacco products and ashtrays from your house, tell friends and family about your quit date, begin taking nicotine replacement therapy (if you plan too) and schedule time for any support groups you’d like to attend. When a craving appears, keep your mind busy, sip water and take deep breaths to delay cravings. Furthermore, the cleaning you receive is professionally-done, meaning you can’t get anything close to it while at home. Schedule an appointment today to complete your new year’s resolution! Dr. Joanne Bancroft earned her DDS degree from the State University of Buffalo School of Dentistry. She’s regularly taking continuing education courses so she can offer the highest quality dental care possible. To learn more about her practice or more resolutions for your oral health, you can contact her through her website. Comments Off on A Dentist Offers 4 New Year Resolutions to Protect Your Mouth!